Hello Society Sisters! Today's post features the Cirque Colors Celestial Collection, a 3-piece thermal collection inspired by planetary bodies. It may be a small collection, but I have lots of pictures showing of each stage when in different temperatures. The formulas were just about flawless and built up to opacity really easily. 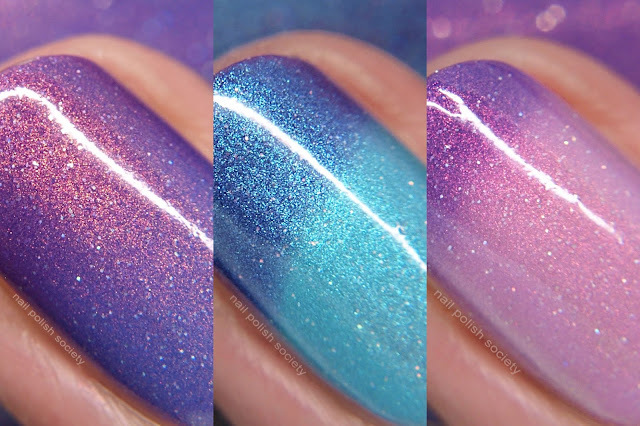 Let's take a look..
Terra is a purple (cold) to light blue (warm) thermal polish with strong copper shimmer and delicate holographic sparkle. Shown is two coats plus top coat. Luna is a dark violet (cold) to turquoise (warm) thermal polish with strong teal shimmer and delicate holographic sparkle. Shown is two coats plus top coat. Sol is a purple (cold) to baby pink (warm) thermal polish with strong pink shimmer and delicate holographic sparkle. Shown is two coats plus top coat. The Celestial Collection is available now. Each polish retails for $14 and can be purchased at cirquecolors.com. What do you think about these shades? I am ALL about that shimmer! And I find it the most fun to wear thermal polishes in the winter where the changes are more dramatic.